Behold, the miserable relic of a toxic era! Its denizens scurry through it, unaware or unable to avoid the poison it gives off. Seriously, though, Grand Central Station gives you a dose of radiation when you go through it, thanks to the granite used to build it. Radiation is a part of the natural world, and so things made with natural materials often contain radioactive elements. In the case of Grand Central Station, the natural material is granite. All natural rocks contain traces of radioactive elements, but granite contains more than others, and certain specimens of granite contain especially high concentrations. 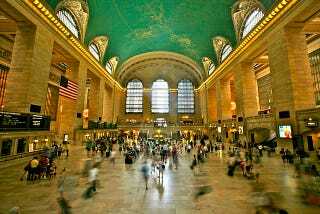 To begin with, the granite in Grand Central includes feldspar, which contains potassium. In any given supply of potassium there is a certain amount of the isotope potassium-40. The isotope breaks down two different ways; by ejecting an electron or by capturing an electron. Of the two, the electron-capture is more damaging, as it is a process that sends out a high-energy gamma ray. Granite is also sprinkled with thorium-232, which decays by sending out an alpha particle and another gamma ray. An alpha particle is a helium nucleus, two protons and two neutrons. Small and light, it doesn't do much damage unless it is released inside the body. Which brings us to uranium. Granite doesn't have a lot of uranium overall, but it does have a greater concentration of uranium than most other natural stones. It can have up to 20 parts per million. Some of that uranium is uranium-238, which decays in stages to radon-222. Radon decays as well, and quickly. It has a half-life of just under four days, and when it decays it shoots out an alpha particle. More importantly, radon is a gas. People nearby it breathe it in, and when it decays it sends alpha particles directly into lung tissue. The rare cases of non-smokers coming down with lung cancer are often the result of exposure to radon gas. It's likely to be found in basements sunk in granite — or in big granite buildings like Grand Central Station. It's worth noting that if Grand Central Station were a nuclear power plant, it would be shut down for exceeding the maximum allowable annual dose of radiation for employees. That being said, it's not actually a dangerous place. When you go there, you're probably more likely to be felled by an oyster than radiation. Images: Alex Proimos and Library of Congress.